On the occasion of the 9th Anniversary of the Diocese of Miao, the Principals and Headmistress of the schools under Newman Educational Society (NES), the educational wing of Diocese of Miao came together to evaluate their performance during the academic year 2014 – 2015. The NES had prepared a list of annual programmes for the effective running of the schools under its ambit. 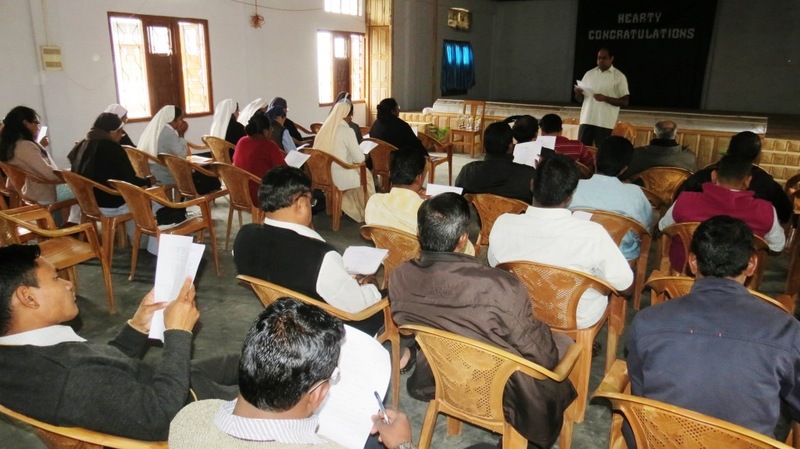 This meeting was to evaluate the steps taken up by the NES and to take appropriate measures to impart quality education to the pupils of NES, said Fr. Thomas Erambil, Secretary of the Commission. “During the last academic year, we were able to organize nearly all the programmes we had planned together in our last evaluation. I thank you for your great cooperation and support.” NES also organized its first Science Expo – Spectrum 2014 at Newman School, Neotan during the last academic year. “Initiatives of this kind will not be possible without your cooperation. But it would be better if more number of schools participated in the event”, he added. Bishop George thanked all the Principals and Headmistress gathered for the event and asked them to be always committed to the service of the children under our care and be worthy of the trust and confidence the parents of these students have on us. “Our endeavour is not just to teach but to educate them”, he added.